In Linamon, on the edge of Iligan City, Mindanao, a group of out of work youth decided to build on the assets of the local area to start their own community based enterprise. One youth group from coastal Linamon had been involved together in a theatre group and making T-shirts and they decided that they would like to try making virgin coconut oil. First they had to learn about virgin coconut oil production by attending trainings. Then they needed to find a suitable processing area. They were lucky--the Barangay of Samburan granted them access to the Youth Council Hall for 5 years. But the building needed complete renovation. So together the boys upgraded the building learning how to do carpentry, painting, wiring and plumbing. It took a while for water and electricity to be connected. Then they started to experiment with production. Production went well and they were pleased with their efforts.But then they had to think about marketing. They could not sell the oil for edible consumption so they targeted the oil few for cosmetic use. 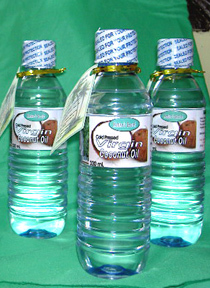 They now sell virgin coconut oil to Eco-Web an NGO in Iligan that makes massage oil for sale to physical therapists. When some of the young boys left the area some of the women in the community joined the enterpise to help with organization and production.